Summary: the NHS and our social care services are under extraordinary pressure. The government continues to claim that the NHS is “safe in their hands”. It is not at all. They claim the NHS is the best in the world yet a report suggests that amongst the top 12 economies, the NHS is the second poorest in terms of preventing, detecting and treating illness. So many wrong decisions have been made about so many aspects of doing the right thing for the NHS it is difficult to know where Labour might start if they get into power. So many of government claims are simply being “economical with the truth”. They must be resisted at every turn. The NHS is the best health service in the world. True. Or at least it was when Labour handed responsibility for it first to the coalition and then to the Tories. We were all greatly reassured by David Cameron many years ago claiming “the NHS is safe in our hands”. He repeated that in his first major speech after 2015 election and said “a 7-day NHS, safe in our hands, for every generation to come”. Theresa May has continued to parrot that phrase, oblivious to the reality faced by anyone who goes near an NHS hospital in 2018. So how come we see television pieces and read in the news media daily about one disaster after another? Ambulances queueing to pass individuals in need of urgent treatment. Stressed nurses working in overloaded A&E departments around the country. 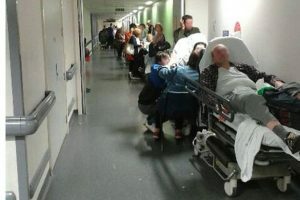 Patients waiting on chairs or trolleys in corridors, unable to be admitted because of other patients stuck in A&E. Patients stuck in A&E because other patients capable of being discharged from wards have nowhere to go since the social care system has been damaged even more than the NHS by real cuts. We have an ageing population, a growing population and a rapidly growing increase in demand. A system that is as grossly overloaded as it is simply cannot cope with any additional pressure from winter flu or any kind of disaster. It takes so long now to get treatment in A&E that many patients are left much worse because they have not been treated in time. Staff are under an intolerable pressure. Shortage of nurses (currently around 40,000) and doctors (about 9000) add to the strain. Application for a nursing position in the NHS requires passing a complex English language test intended for academics that includes a significant essay question. This causes many who speak perfectly adequate functional English to fail. Applications from nurses from the EU have dropped enormously, by a factor of more than 20, because of the risks around the insanity of Brexit that the nurses may simply be arbitrarily repatriated. Doctors appointed to NHS hospitals from overseas currently cannot get visas because the quota has been exceeded. Nurse training now requires fees and accommodation to be paid for by the trainee nurse and not by the NHS who used to provide bursaries and subsidised accommodation. The idea that any young person might wish to become a nurse given the current TV coverage of the awful stress they will experience seems quite unlikely. 4/5 NHS nursing directors say their hospitals rely on the goodwill of staff to keep things running. There is more here: http://outsidethebubble.net/2017/02/02/government-driving-up-non-eu-immigration-intentionally/ . What is causing this chaos? Surprise, surprise it’s all about money and the Tory obsession with austerity! It all started when Thatcher introduced the internal market, splitting the purchaser (health authorities) and the provider (hospitals) that were contracted to provide services. Labour opposed this strongly until they got into power then embraced it with enthusiasm. Tony Blair went much further, making the structure much more complex as well as getting into Private Finance Initiatives which to this day continue to drain money from the NHS. At least during the Labour years money continued to grow for the NHS. Not now, under the Tories. When the Tories got their hands on the whole business the decided to trim every aspect of the health and social services in the UK (efficiency savings, of course), and further cuts are planned (yes, seriously). The Bank of England managed to print nearly £500 billion of new money in recent years to keep the banks afloat. When it came to health and social services, cuts were the order of the day. Income tax on the wealthy, increased to 50% in 2010, was reduced to 45% a couple of years later. Over the last 10 years funding for the NHS and in particular the social services has lagged well behind inflation. The increase in demand and the size and age of the population continue to be simply ignored. The Tories insisted that the extra demand was simply because of large scale immigration from the EU. The right-wing media seized on that and the effect on demand of the (almost non-existent, in reality) scroungers. Public funding for healthcare is forecast to fall from 7.6% of the GDP in 2009/10 to 6.8% by 2019/20. The rates in France are just under 9%, and Germany just over 9% of GDP. Increases in the NHS will average only 1.1% per annum through that period, very far from keeping up with the increasing demand or the increase in the cost from improved treatment procedures. The recent announcement of a very small increase in the NHS budget in the 2017 budget is tiny and will have very little effect on the current multiplicity of crises. Estimates from The King’s Fund suggest that funding is currently running at least £4 billion lower in real terms than required. Less than a year ago Theresa May again claimed the NHS was the best in the world, and absolutely safe in Tory hands. In fact the NHS was rated the second poorest out of 11 rich countries in healthcare outcomes assessed on the prevention, detection and treatment of illnesses. The pay cap on many including nurses in the NHS has been lifted yet no new money provided to fund increases. Yet there is worse still. Social care funding has dropped over the last eight years in real terms of over 8%. As a consequence the availability of places for convalescence, essential to help unblock the bed occupancy in hospitals is even poorer than it ever was. Only by providing such space is it possible to unblock the appalling logjam that is a typical NHS hospital today. Only today the Children’s Commissioner for England, Anne Longfield, reports that the provision for children’s health in England is much poorer than in Scotland, Northern Ireland or Wales. In Scotland they have just passed an ambitious act to reduce child poverty and develop a new mental health strategy. The Tory government seems to see children as a burden on society. Austerity means we now have 72,000 children in care. The Tories made this worse by introducing a two child limit for family credit. This shows just how much they value children and how happy they must be to make the lives of poor families even more difficult. Child obesity now runs at about 20% in year 6 (ages 10-11), and up to 26% in children from disadvantaged backgrounds. An obese child has an 80% chance of becoming an obese adult, with a life expectancy shortened by between 10 and 20 years. The Tories claim to have a world-leading plan to deal with child obesity. It is probably as complete as their Brexit Impact assessments (i.e. doesn’t exist). Legal action is again being taken against the government for their failure to deal with the High Court judgement against their inadequate plans to improve the quality of the very toxic air in our cities. Where will the money come from? Assuming that the government are not prepared to get the Bank of England to print perhaps 1% of the money they printed for the banks over recent years, the idea of increasing tax on the very wealthy is totally dismissed by the Tories. Today we also have the news from the Tax Justice network that the Treasury have instructed HMRC not to worry about Amazon’s non-payment of tax. Another source of money that would make such a difference to the NHS but instead going to multi-billionaires overseas. It is clear that the NHS really is NOT safe in their hands. Those hands are pretty lethal in reality. Labour will have to work so hard to unscramble this mess that is so bad that even 70% of Tory supporters are very concerned about the NHS, and fewer than 40% think Jeremy, the Health Secretary, should keep his job. It is right to be concerned for the NHS but so little is written about its users, comparatively. We, the funders and appreciative patients have needs and experiences which are what it is there for. It is time to measure needs as much as resources. The assumption for very many years is that the managers know best about what the NHS needs and the politicians will agree or disagree. Together they set the agenda of what must be done. One of the big problems in the NHS is the complex hierarchy and a great deal must be learned from the people working lower down the hierarchy such as the nurses and the staff on frontline duty. It is also important to engage the patients and their friends and relatives who have been with them and experienced what actually happens. In particular I think the friends and relatives are important because they are able to take a view of what happened without the worry of their own condition. Good point indeed!